"When I think of you, I think of bug-infested poop. And football. Because I hate football." Gee, at this point, why not just cut to the chase? "The Message Cookie: When you hate enough to actually spend money on more clearly expressing your hatred." Remember, E.M., if you're ever offered a poo-spotted football cake, the proper response is: "Thanks, but I think I'll pass." - Related Wreckage: Graduate! Celebrate! "Decorate!" Or maybe the message is "Nothing beats playing football in a cow pattie field!" Or maybe . . . not. Down here in Tennessee Titans country, I'm sure this cake is a message about the season so far this year. 0-6. Poop cake is appropriate. "No thanks, I'll pass." Nice work on the double pun. Turtle recall. Oh man, I'm still reeling on that one. Good times, good times. Is it bad that even though today's wreck is horribly done I would still eat it because it's cookie cake? Is that a real football? Or is it made of footbally icing? Oh, Jen, there is not a day goes by that you don't add a giggle, a snicker, a great big ol' grin to it. Thank you, lady; what a treasure you are! Now, Jen...do you mean pass the ball or pass a #2? Either way...I'm steering clear. I think I need to find that cookie because there are so many people I dislike as much as football. Ha ha I was reading this post and my 18 month old son came over and pointed at the computer and said, "stinky"
Ew, I will never eat chocolate chips again. I'll never look at chocolate donuts the same way again. Or dog poop. Also, what on earth is a cookie cake? I don't think we have them in the uk? New to this blog and it's resopnsible for lots of procrastination at work now! I'm wondering... where do you put the message? Maybe it's hidden under the plastic football? There are so many good ways to add extra chocolate to things...why do so many people fail so hard at doing it decently? this cookie cake is spot on with respect to my feelings about football in general. We went to a big chain bookstore last night and looked through a copy of your book. We just laughed and laughed. Instead of putting it back away, we left it on the table by the chairs hoping someone else would pick it up. Will definitely be buying a copy for our coffee table soon! Justin's comment reminded me of that steer they use to poop on a grid. Maybe he is on to something. And thanks for the heads up (via Tweet) on the cute nerdy TV show, The Big Bang Theory. My husband laughed and laughed. It was fun watching him. I wanted to say that I just found this site and am very sad I didn't find it sooner. I have not been able to pull myself away from the computer for the last few days. Your site is HILARIOUS! In our school district, they have a fundraiser for the football team called the Cow Pattie Drop, during which they have a grid marked on the football field and they walk a very full cow (or steer or bull... who knows?) around on the field. Everyone has made bets to see which square on the grid the cow will "drop" his/her pattie(s). The winner gets a prize and the football team keeps the money, or something like that. I am NOT making this up. See how it all ties in? Cow patties and football go hand-in-hand here in Texas. I think the message is: "Pick up after your dog so we can play football, you inconsiderate pet owner." I think that cake was made for the Tennessee Titans who defiantly know how to "stink it up" on the field!!! At first glance, I looked at this and thought "Football in a messy desert? Or on a messy beach? Palam trees behind the football...Littered with bugs and camel poo..."
Poo seems to be a frequent theme among the cake-decorating community. Is there a secret poo-perfecting guild of cake decorators nationwide, practicing their secret art of poo-piping? It takes a special kind of customer to appreciate a cake with a scategorical theme. Look how much you can say without saying a word, and for only 8 bucks, too! Much cheaper to send this than, say, put a horse's head in someone's bed. And once again, think twice on the brown icing, everyone. I'm starting to think that's pretty good advice for life. "No thanks, I think I'll pass"
Is that a real football, or is it a creation? Because, if the decorator created that, I can see why they had no creative energy left for the rest of the - er - cookie. Ew. That looks like a real rubbery football. You can only hope it had been washed and is not spreading dirt/chemicals on the cake. I shudder to think what the full message looked like. Decorated by an angry football widow? RE: "Also, what on earth is a cookie cake? I don't think we have them in the uk?" It's a large, thick cookie made with little or no leavening, resulting in a dense and chewy texture. Chocolate, er, chip by the look of it. According to the label, this is only one-fourth of a "Message Cookie." That must have been a really big cookie before they cut it up. Maybe somewhere on the other three-fourths there's an explanation of what's supposed to be going on here. ... 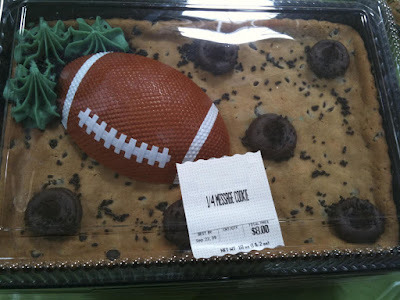 But why would you want a football, a real football, I mean (at least it looks real), on your cake? The piles of ... er ... stuff could have been meant to represent something else (no, I don't know what else), but that football looks completely intentional. My high school used to hold Cow Dumps, fundraisers where they'd let cows out on the football field and people would bet which yard line the cow would poop in. :::sigh::: Sadly, I am not making this up. I love this blog ! I found it today on the N.Y.Times on line, and it was a funny moment in my poop-job. Congratulations from Paris/France. Hanna. J'adore ce blog ! je l'ai decouvert aujourd'hui sur le N.Y.Times en ligne, c'etait une vraie recreation dans ma journee de boulot. Felicitations parisiennes ! Hanna. WTF??? Seriously I think this is the most baffling Wreck yet. What the heck are those circles supposed to even be? I would love to get into the minds of these folks and just find out the process. @Hanna--I read your comment, and wondered why it said the same thing twice...until I realized that it was in English _and_ French. Guess my French is better than I thought! Vous avez decouvert le blog meilleur de l'Internet! Playing football in a mine field? snap, that is a pile of crap. I'm glad that someone else picked up on the "1/4 Message" too. I know that it means one fourth of a sheet cake...but you all had some pretty good ideas about what the 1/4 might mean instead. Personally, I thought that maybe, just maybe...the rest of the message was on the other 3/4 of the cookie cake. you guys might like the woot shirt today. maybe. Actually this reminds me of my son's first birthday cake. We held the party in a park and a football landed in the cake! Seriously. No bugs or poo though, that I knew of. i really love your blog. firat time i leave a comment, but i already linked to you in mine. This could be my favorite post ever. haha that is funny. Who wouldn't see that as looking like poo? Unfortunately I think I just might get the message. I'm from Ohio, and our mascot for just about everything is the Buckeye. For those of you with actual lives, the buckeye is a little round brown nut that is kind of like an acorn except much less cute. I suspect that might be what those little poop balls are intended to be. And that would also explain the random green barf in the corner. Is that thing even a cookie? I seriously want to meet these cake decorators...and the managers who hired them. Reminds me of Andy Griffith's What it was, It was Football. I don't know friends, to this day, what it was that they was a doin' down there, but I have studied about it. I think it was that it's some kindly of a contest where they see which bunchful of them men can take that pumpkin and run from one end of that cow pasture to the other without gettin' knocked down or steppin' in somethin'. Can I please order one of these for the crap-tastic beyotch who's married to my husband's bro? Because she truly is a troll. And I can't stand her. Neither can I stand bug-covered poo nor football. ps - I just want to send out a Mad Props to all the commenters here -- you all make me laugh, too! There's nothing I like better than a fresh football pun in the evening. I'd try to defend that statement but I'm afraid it would be too offensive and touch down on something sensitive. @Hanna, I totally agree with Elizabeth: "Vous avez decouvert le blog meilleur de l'Internet!" Jen and John, you bring a smile every day. Thanks for your wonderful blog! Wreck on! Jen, Jen, Jen. Don't split your infinitives - it hurts their feelings if you stick an adverb between them. Please tell me you watched "18 kids and Counting" tonight on TLC. 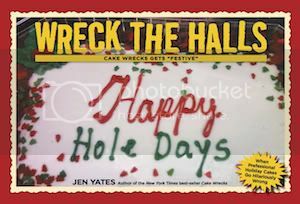 There was a hilarious Cake Wreck and I immediately thought of you! This is a famous reality TV family who just gave birth to a much anticipated grandchild...they have been featured on the Today show (or was it good morning america?). Anyway, they were throwing Anna, the expecting mother, a shower and bought a sheet cake for the party. The baker spelled the child's name wrong!!!! Luckily, Michelle (the soon to be grandmother) was crafty and did a little work on the cake to "repair" it. Bet that baker is wishing her mistake wasn't all over TV right now! Misfit @ 9:25 p.m.: Didn't you get the memo? Split infinitives are allowed nowadays. Have you been asleep for the past thirty years? On the other hand, Jen, I'm looking askance at "alright" . . . but I know you've had rather a full load lately, so. "I think your football team is a pile of...."
Oh, this made my day! Hilarious! I WORSHIP YOUR BLOG!!! I can't go a day without reading. I love your recent poop theme. Too funny. I might have to actually stop reading this website after this cake because I'm not sure I'll ever read anything this funny again and I don't want to set myself up for any more disappointment down the line.